For current operations under the Conrail name, see Conrail Shared Assets Operations. Conrail (formally the Consolidated Rail Corporation, with reporting mark CR) was the primary Class I railroad in the Northeastern United States between 1976 and 1999. The trade name Conrail is a portmanteau based on the company's legal name, and while it no longer operates trains it continues to do business as an asset management and network services provider in three Shared Assets Areas that were excluded from the division of its operations during its acquisition by CSX Corporation and the Norfolk Southern Railway. The Federal Government created Conrail to take over the potentially-profitable lines of multiple bankrupt carriers, including the Penn Central Transportation Company and Erie Lackawanna Railway. After railroad regulations were lifted by the 4R Act and the Staggers Act, Conrail began to turn a profit in the 1980s and was privatized in 1987. The two remaining Class I railroads in the East, CSX Transportation and the Norfolk Southern Railway (NS), agreed in 1997 to acquire the system and split it into two roughly-equal parts (alongside three residual shared-assets areas), returning rail freight competition to the Northeast by essentially undoing the 1968 merger of the Pennsylvania Railroad and New York Central Railroad that created Penn Central. Following approval by the Surface Transportation Board, CSX and NS took control in August 1998, and on June 1, 1999 began operating their respective portions of Conrail. The old company remains a jointly-owned subsidiary, with CSX and NS owning respectively 42 percent and 58 percent of its stock, corresponding to how much of Conrail's assets they acquired. Each parent, however, has an equal voting interest. The primary asset retained by Conrail is ownership of the three Shared Assets Areas in New Jersey, Philadelphia, and Detroit. Both CSX and NS have the right to serve all shippers in these areas, paying Conrail for the cost of maintaining and improving trackage. They also make use of Conrail to perform switching and terminal services within the areas, but not as a common carrier, since contracts are signed between shippers and CSX or NS. Conrail also retains various support facilities including maintenance-of-way and training, as well as a 51 percent share in the Indiana Harbor Belt Railroad. In the years leading to 1973, the freight railroad system of the United States was collapsing. Although government-funded Amtrak took over intercity passenger services in 1971, railroad companies continued to lose money due to extensive government regulations, expensive and excessive labor cost, competition from other transportation modes, declining industrial business, and other factors. Its largest Eastern railroad, the Penn Central Railroad (PC), had declared bankruptcy in 1970, after less than three years of existence. Formed in 1968 by the merger of the New York Central Railroad and Pennsylvania Railroad (and supplemented in 1969 by the New York, New Haven and Hartford Railroad), the PC was created with almost no plans to merge the varied corporate cultures, and the resulting company was a hopelessly entangled mess. At its lowest point, PC was losing over $1 million a day and trains were becoming lost all over the railroad. In 1972, Hurricane Agnes damaged the rundown Northeast railway network and threatened the solvency of other railroads, including the somewhat more solvent Erie Lackawanna (EL). In mid-1973, officials with the bankrupt Penn Central threatened to liquidate and cease operations by year's end if they did not receive government aid by October 1. This threat to US freight and passenger traffic galvanized the Congress to quickly create a bill to nationalize the bankrupt railroads. The Association of American Railroads, which opposed nationalization, submitted an alternate proposal for a government-funded private company. Judge Fullam forced the Penn Central to operate into 1974, when, on January 2, after threatening a veto, President Richard Nixon signed the Regional Rail Reorganization Act of 1973 into law. The "3R Act," as it was called, provided interim funding to the bankrupt railroads and defined a new Consolidated Rail Corporation under the Association of American Railroads' plan. The 3R Act also formed the United States Railway Association (USRA), another government corporation, taking over the powers of the Interstate Commerce Commission with respect to allowing the bankrupt railroads to abandon unprofitable lines. The USRA was incorporated February 1, 1974, and Edward G. Jordan, an insurance executive from California, was named president on March 18 by Nixon. Arthur D. Lewis of Eastern Air Lines was appointed chairman April 30, and the remainder of the board was named May 30 and sworn in July 11. Under the 3R Act, the USRA was to create a "Final System Plan" to decide which lines should be included in the new Consolidated Rail Corporation. Unlike most railroad consolidations, only the designated lines were to be taken over. Other lines would be sold to Amtrak, various state governments, transportation agencies, and solvent railroads. The few remaining lines were to remain with the old companies along with all previously abandoned lines, many stations, and all non-rail related properties, thus converting most of the old companies into solvent property holding companies. The plan was unveiled July 26, 1975, consisting of lines from Penn Central and six other companies—the Ann Arbor Railroad (bankrupt 1973), Erie Lackawanna Railway (1972), Lehigh Valley Railroad (1970), Reading Company (1971), Central Railroad of New Jersey (1967) and Lehigh and Hudson River Railway (1972). Controlled railroads and jointly owned railroads such as Pennsylvania-Reading Seashore Lines and the Raritan River Railroad (1980) were also included (See list of railroads transferred to Conrail for a full list). It was approved by Congress on November 9, and on February 5, 1976 President Gerald Ford signed the Railroad Revitalization and Regulatory Reform Act of 1976, which included this Final System Plan, into law. The EL had been formed in 1960 as a merger of the Erie Railroad and Delaware, Lackawanna and Western Railroad. It too was bankrupt, but was somewhat stronger financially than the others. It was ruled reorganizable under Chapter 77 on April 30, 1974 (as had the Boston and Maine Railroad), but on January 9, 1975, with no end to its losses in sight, its trustees reconsidered and asked for inclusion. The Final System Plan assigned a major section of the EL, from northern New Jersey west to northeast Ohio, to be sold to the Chessie System, which would help spur competition in Conrail's territory. Chessie however could not reach an agreement with EL labor unions, and in February 1976 announced that it would not be buying the EL section. The USRA hurriedly assigned large amounts of trackage rights to the Delaware and Hudson Railway, allowing it to compete in the Philadelphia, Pennsylvania, and Washington, D.C., markets. The State of Michigan decided to keep operational the full Ann Arbor Railroad, of which Conrail would run only the southernmost portion. Michigan bought it and the whole line was operated by Conrail for several years until it was sold to a short line. Conrail was incorporated in Pennsylvania on October 25, 1974, and operations began April 1, 1976. The government owned 85% with employees owning the remaining 15%. The theory was that if the service was improved through increased capital investment, the economic basis of the railroad would be improved. During its first seven years, Conrail proved to be highly unprofitable, despite receiving billions of dollars of assistance from Congress. The corporation declared enormous losses on its federal income tax returns from 1976 through 1982, resulting in an accumulated net operating loss of $2.2 billion during that period. Congress once again reacted with support by passing the Northeast Rail Service Act of 1981 (NERSA), which amended portions of the 3R Act by exempting Conrail from liability for any state taxes and requiring the Secretary of Transportation to make arrangements for the sale of the government's interest in Conrail. After NERSA was implemented, Conrail, under the aggressive leadership of L. Stanley Crane began to improve and reported taxable income between $2 million and $314 million each year from 1983 through 1986. Although Conrail's government-funded rebuilding of the dilapidated infrastructure and rolling stock it inherited from its six predecessors succeeded by the end of the 1970s in improving the physical condition of tracks, locomotives, and freight cars, the fundamental economic regulatory issues remained, and Conrail continued to post losses of as much as $1 million a day. Conrail management, recognizing the need for more regulatory freedoms to address the economic issues, were among the parties lobbying for what became the Staggers Act of 1980, which significantly loosened the Interstate Commerce Commission's rigid economic control of the rail industry. This allowed Conrail and other carriers the opportunity to become profitable and strengthen their finances. The Staggers Act allowed the setting of rates that would recover capital and operating cost (fully allocated cost recovery) by each and every route mile the railroad operated. There would be no more cross-subsidization of costs between route-miles (that is, revenue on profitable route segments were not used to subsidize routes where rates were set at intermodal parity, yet still did recover fully allocated costs). Finally, where current and/or future traffic projections showed that profitable volumes of traffic would not return, the railroads were allowed to abandon those routes, shippers and passengers to other modes of transportation. Under the Staggers Act, railroads, including Conrail, were freed from the requirement to continue money-losing services. Conrail began turning a profit by 1981, the result of the Staggers Act freedoms and its own managerial improvements under the leadership of L. Stanley Crane, who had been chief executive officer of the Southern Railway. While the Staggers Act helped immensely in allowing all railroads to more easily abandon unprofitable rail lines and set its own freight rate, it was under Crane's leadership that Conrail truly became a profitable operation. Soon after Crane took office in 1981 he shed another 4,400 miles from the Conrail system in the following two years, which accounted for only 1% of the railroad's overall traffic and 2% of its profits while saving it millions of dollars in maintenance costs. NERSA relieved Conrail of its requirement to provide commuter service on the Northeast Corridor, further improving its finances. In 1984, the government put its 85% share up for sale. Bids were received from Alleghany Corporation, Citibank, an employee buyout, Guilford Transportation Industries, Norfolk Southern Railway and a consortium headed by J. Willard Marriott. On February 8, 1985 Secretary of Transportation Elizabeth Dole announced Norfolk Southern Railway as the successful bidder. After considerable debate in Congress, the Conrail Privatization Act of 1986 was signed into law by President Reagan on October 21, 1986. However, in August 1986, Norfolk Southern had withdrawn its bid citing Congress delays and taxation changes. The government decided its interest in Conrail would then be sold by the then-largest initial public offering in US history. The sale was effective from March 26, 1987 when Conrail's stock, worth $1.65 billion, was sold to private investors. Conrail inherited the commuter rail operations of its predecessor lines, and operated them until 1983, when these services were transferred to state or metropolitan transit authorities (except for those within the Massachusetts Bay Transportation Authority service district, which were transferred to the Boston and Maine Railroad, under contract to the MBTA, in March 1977). Except for MARC, the transit authorities purchased the track and right-of-way on which their commuter operations ran, leaving Conrail freight operations as a tenant. With Conrail's increasing success, they decided to merge the company with another railroad, so they approached CSX Transportation about buying the company, this however drew the attention of Norfolk Southern Railway leading to a takeover battle between the 2 railroads. In 1997, however, the two railroads struck a compromise agreement to jointly acquire Conrail and split most of its assets between them, with Norfolk Southern acquiring a larger portion of the Conrail network via a larger stock buyout. Under the final agreement approved by the Surface Transportation Board, Norfolk Southern acquired 58 percent of Conrail's assets, including roughly 6,000 Conrail route miles, and CSX received 42 percent of Conrail's assets, including about 3,600 route miles. The buyout was approved by the Surface Transportation Board (successor agency to the Interstate Commerce Commission) and took place on August 22, 1998. Under the control of lawyer-turned CEO Tim O'Toole, the lines were transferred to two newly formed limited liability companies, to be subsidiaries of Conrail but leased to CSX and Norfolk Southern, respectively New York Central Lines (NYC) and Pennsylvania Lines (PRR). The NYC and PRR reporting marks, which had passed to Conrail, were also transferred to the new companies, and NS also acquired the CR reporting mark. Operations under CSX and NS began June 1, 1999. As the names indicated, CSX acquired the former New York Central Railroad main line from New York City and Boston, Massachusetts to Cleveland, Ohio, and the former Cleveland, Cincinnati, Chicago and St. Louis Railway (NYC Big Four) line to Indianapolis, Indiana (continuing west to East St. Louis, Illinois on a former Pittsburgh, Cincinnati, Chicago and St. Louis Railroad (PRR Panhandle Route line), while Norfolk Southern got the former Pennsylvania Railroad main line and Cleveland and Pittsburgh Railroad from Jersey City, New Jersey to Cleveland, and the rest of the former NYC main line west to Chicago, Illinois. Thus the Conrail "X" was neatly split in two, CSX getting one diagonal from Boston to St. Louis and Norfolk Southern the other from New York to Chicago. The two lines cross at a bridge southeast of downtown Cleveland (41°26′49″N 81°37′37″W﻿ / ﻿41.447°N 81.627°W﻿ / 41.447; -81.627), where the former Cleveland and Pittsburgh Railroad crosses over the NYC's former Cleveland Short Line Railway around the south side of Cleveland. In three major metropolitan areas – North Jersey, South Jersey/Philadelphia, and Detroit – Conrail Shared Assets Operations continues to serve as a terminal operating company owned by both CSX and NS. The Conrail Shared Assets Operations arrangement was a concession made to federal regulators who were concerned about the lack of competition in certain rail markets and logistical problems associated with the breaking up the Conrail operations as they existed in densely populated areas with many local customers. The smaller Conrail operation that exists today serves rail freight customers in these markets on behalf of its two owners. A fourth area, the former Monongahela Railway in southwest Pennsylvania, was originally owned jointly by the Baltimore and Ohio Railroad, Pennsylvania Railroad and Pittsburgh and Lake Erie Railroad. Conrail absorbed the company in 1993, and assigned trackage rights to CSX, the successor to the B&O and P&LE. With the Conrail breakup, those lines are owned by NS, but the CSX trackage rights are still in place. Conrail 6114, a GE Dash 8-40CW, leads a train westbound out of Altoona, Pennsylvania. Conrail was divided between Norfolk Southern Railway and CSX Transportation in 1999, with all remaining locomotives having been repainted, but ex-CR units can be spotted. CR units had similar features such as "Bright Future" blue paint, flashing ditch lights, and Leslie RS-3L horns. Another key spotting feature is ditchlights mounted under the locomotive's front deck. All Of The xCR Units That Have Those Ditchlights Have Gone To CSX. This is a preference different from Norfolk Southern, who orders their locomotives with the lights above the deck. Marker lights, or class lights, were also a preference of Conrail. Most Conrail engines still have marker lights on CSX, while NS opted to remove them. All Conrail locomotives that went to CSX were re-painted into CSX colors. All of the Conrail units owned by NS have been either repainted or retired, as the last unit in 'Big Blue' being NS 8312, was retired. Conrail was the only railroad to receive EMD SD80MACs (the Chicago North & Western were originally supposed to receive SD80MACs with marker lights, but when that railroad merged with Union Pacific, the order was rescinded) and were separated evenly between CSX and NS. Conrail had a different scheme for these locomotives and also the SD70MAC, with a large white, cone shaped line on the front, bearing "Conrail Quality". The SD70MACs weren't fitted with marker lights, as it would be useless when given to NS and CSX. This goes along with the standard-cab SD70, Conrail's final order of locomotives, as they were in Norfolk Southern's preferred numbering (the 2500 series). In early 2015, the remaining 12 ex-Conrail SD80MACs owned by CSX, were purchased by Norfolk Southern, and renumbered 7217-7228. Most have been repainted, and currently, all of them still have red marker lights intact, but it is unclear whether or not they will be removed. 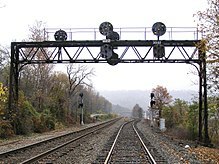 Since Conrail acquired many separate railways, and the North American railway signalling system is not standardized, operators needed to qualify on as many as seven different signalling systems. The varying systems include, but are not limited to, the PRR position light signals, the NYC searchlight signals and tri-light signals, and the EL tri-light signals. The NYC tri-light was adopted as Conrail's systemwide standard for new signal installations. Most of the existing technologies were defined by the Northeast Operating Rules Advisory Committee (NORAC). Conrail had its own, unique tri-light signal modernization program that was applied to many routes. Today, most Northeastern railroads associated with former Conrail assets are working towards standardization of all systems as vertical color light signals. Meanwhile, Amtrak uses a modified version of the PRR position light signals called "Position Color Lights". The Conrail Historical Society, Inc., is a 501(c)(3) non-profit organization based in Marysville, Pennsylvania. The society aims to preserve and restore equipment, items pertaining to, and photographs of Conrail, specifically and of American railroading in general. As of 2015, the group publishes a quarterly magazine and a calendar, as well as other occasional mailings. Previous conventions have been held in Altoona, Pennsylvania, Philadelphia, Cleveland, and Warren, Ohio. More recent preservation activities include completion of the cosmetic restoration of caboose 21165 and significant metalwork and floor-replacement on gondola 67257. The CRHS owns seven pieces of on-track equipment: caboose 21165 and track car 328, G36L class Gondola 67257, F41 class flat car 715788, CR MOW Camp car 62610, N11 caboose 18452, and former Triple Crown RoadRailer TCSZ 463491. A small railroad in southwestern Minnesota owns an EMD SW1200 locomotive, no. 9330, still painted in Conrail blue. A preserved Conrail ex-PRR GP30 is on display at the Railroad Museum of Pennsylvania. To mark its 30th anniversary, Norfolk Southern painted 20 new locomotives with the paint schemes of predecessor railroads. The first, on March 15, 2012, was GE ES44AC #8098 in Conrail blue with the "can opener" logo. ^ Stover (1997), p. 226. ^ Stover (1997), p. 233–234. ^ a b American-Rails.com. "Conrail, The Consolidated Rail Corporation". Retrieved 2010-12-17. ^ Regional Rail Reorganization Act of 1973, Pub.L. 93-236, 87 Stat. 985, 45 U.S.C. § 741. Approved 1974-01-02. Note: The approved bill was also called the "Northeast Region Rail Services Act." Section 1 of Pub.L. 93–236 provided that the law may be cited as "Regional Rail Reorganization Act of 1973." See 45 U.S.C. 701 note. ^ Keeffe, Arthur John (July 1974). "Current Legal Literature: Hear That Whistle Down the Line?". ABA Journal. American Bar Association. 60: 860. ^ U.S. Railway Association (USRA), Washington, DC (1975-02-26). "Fact Sheet: The Preliminary System Plan for Restructuring the Railroads of the Northeast and Midwest." ^ Railroad Revitalization and Regulatory Reform Act, Pub. L. 94-210, 90 Stat. 31, 45 U.S.C. § 801. 1976-02-05. ^ "The Delaware and Hudson Railway". ^ Northeast Rail Service Act of 1981, Pub. L. 97-35, 45 U.S.C. ch. 20, 1981-08-13. ^ 45 U.S.C. § 761. ^ a b "NAE Website – Mr. L. Stanley Crane". ^ Staggers Rail Act of 1980, Pub. L. 96-448, 94 Stat. 1895. Approved 1980-10-14. ^ Phillips, Christopher (March 1994). "This Railroad Is Building Up Speed". Kiplinger's Personal Finance. p. 38. ^ Sterngold, James (1987-03-27). "85% U.S. Stake in Conrail Sold for $1.6 Billion". New York Times. Retrieved 17 March 2011. ^ Belcher, Jonathan (26 December 2015). "Changes to Transit Service in the MBTA district" (PDF). NETransit. Retrieved 26 February 2016. ^ Maryland Transit Administration. Baltimore, MD. "History of MARC Train." Archived 2010-11-15 at the Wayback Machine Accessed 2011-03-16. ^ "Conrail Chugs Off Into the Sunset; CSX and Norfolk Southern Take Over". The New York Times. 1 June 1999. ^ http://www.railroad-signaling.com. "Signal Aspects." Reference chart of NORAC signals with illustrations. Accessed 2010-11-21. ^ "Conrail Historical Society Preservation Projects". Archived from the original on 2014-02-15. Jacobs, Timothy (1996). History of the Pennsylvania Railroad. New York: Smithmark. ISBN 0-517-63351-5. EuDaly, Kevin; Schafer, Mike; et al. (2009). The Complete Book of North American Railroading. Minneapolis: Voyageur Press. ISBN 978-0-7603-2848-4. OCLC 209631579. Stover, John F. (1997). American Railroads (2nd ed.). Chicago: University of Chicago Press. ISBN 978-0-226-77658-3. Withers, Paul (1997). Conrail, The Final Years: 1992–1997. Halifax, PA: Withers Publishing. ISBN 978-1-881411-15-4. "A Brief History of Conrail". Consolidated Rail Corporation. 2003. Archived from the original on 2010-11-21. Retrieved 2011-02-16. The Special Court Reporter available at Hagley Museum and Library constitutes a step-by-step account of the Special Court's proceedings and the playing out of the final stages of railroad reorganization in the Northeast.